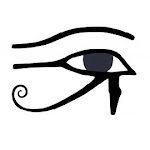 If you have made comments on the Age of Autism article Autism Advocacy Organizations and Parent Groups Support Dr. Andrew Wakefield, please copy your comment here, including the date and time you posted at AoA. "These libelous accusations are based on the flimsiest possible construct." You know, England has really plaintiff-friendly libel laws (defendant needs to prove that the statements are not libelous, rather than plaintiff proving they are, and loser pays all costs for the litigation). 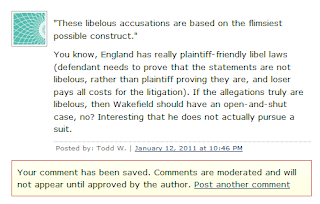 If the allegations truly are libelous, then Wakefield should have an open-and-shut case, no? Interesting that he does not actually pursue a suit. 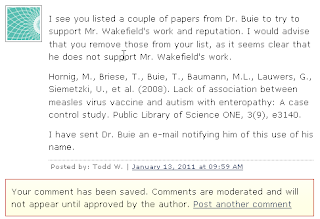 I see you listed a couple of papers from Dr. Buie to try to support Mr. Wakefield's work and reputation. I would advise that you remove those from your list, as it seems clear that he does not support Mr. Wakefield's work. Hornig, M., Briese, T., Buie, T., Baumann, M.L., Lauwers, G., Siemetzki, U., et al. (2008). Lack of association between measles virus vaccine and autism with enteropathy: A case control study. Public Library of Science ONE, 3(9), e3140. 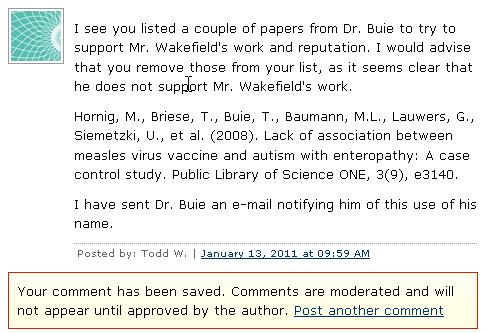 I have sent Dr. Buie an e-mail notifying him of this use of his name. typical attitude at the age of autism...the are nothing but dictators and wolves in sheeps clothing..